GROSPURTTM products are now finally available in CANADA for farmers and growers to use to enhance many crops including; fruits, vegetables, flowers, cereal grains, golf turf, pasture grass, etc. Please see labels for complete list of crops. 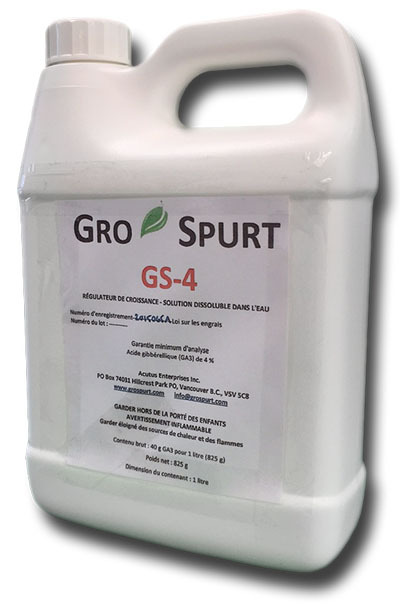 GS4 is a new state of the art water-soluble liquid plant growth hormone formulation. Available in 1-liter containers, our liquid formulation provides ease of use and complete solubility in water. This ensures that all of the active ingredient (GA3) is dispersed when spraying to maximize uptake and absorption. 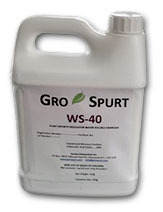 WS40 is a highly concentrated granular formulated plant growth hormone. Available in 320g containers, our granular formulation dissolves instantly and completely in water with minimal agitation to provide ease of use. Complete solubility ensures that all of the active ingredient (GA3) is dispersed when spraying to maximize uptake and absorption. 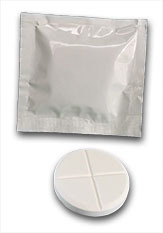 Product is also available in 20% concentration (WS-20) in 320g containers. WT20 is an effervescent water-soluble tablet formulated plant growth hormone. Available in tablets of 50 per box. Our tablets deliver the same amount of active ingredient (GA3) as other brands of tablets but with a higher guaranteed purity of GA3 (>90%). GROSPURTTM 90 is the highly concentrated, active ingredient in all of the GROSPURTTM products and has the highest guaranteed purity in the industry (greater than 90% purity). It has been traditionally applied for many years on cherries to produce larger, brighter colored and firmer fruit.